For the first time, lack of faith in politics, politicians and government has become one of the top ten issues for Britain, polls show. How should politicians respond? Image: Jeremy Corbyn speaking to Labour's 2018 conference. Credit: Han Yan/Xinhua News Agency/PA Images, all rights reserved. It’s no small task – and Labour will need a clear plan to make this ambition a reality. We’re currently witnessing a concerted effort to twist our democracy even further in the executive’s favour. Many are starting to notice. 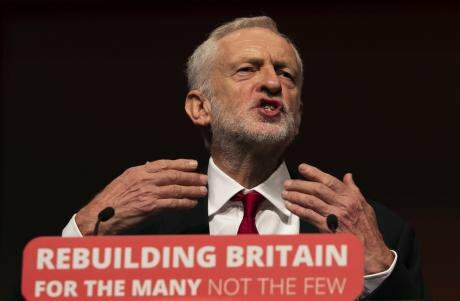 In a recent poll for the Electoral Reform Society by BMG Research, 75% of Labour supporters believed “democracy in Britain is in urgent need of reform” – alongside two thirds of the general public. This view crosses many of the dividing lines in politics, both new and old. 71% of Leave voters and 66% of Remain voters agreed with the statement. The need for an overhaul is getting more urgent. Take, for instance, the current constituency boundary review. The government say they are intent on ‘equalising’ the size of constituencies, to ensure “fair and equal representation for voters across the UK". This is a sleight of hand: the ‘equalisation’ turns out to be a conduit for slashing the number of MPs. Since there has been no pledge to reduce the size of the government’s ‘pay-roll vote’ (MPs who have no choice but to vote in line with the government if they want to hold on to their ministerial positions), that means fewer backbench MPs. And that means less scrutiny. For all the talk of fairness, Westminster’s voting system is built on unfairness. Because of its single-seat, winner-takes-all nature, you only need a few voters to switch or not turn out for an entire result to change. Eleven seats were won by fewer than 100 votes in 2017. Had 533 votes changed in 2017 we would have a majority Conservative government today. The Greens can win over 500,000 votes and just one seat, while the DUP can win ten seats with fewer than 300,000 votes – simply because their voters live closer together. Millions more votes go wasted (two thirds in fact) – not contributing to the result – or are cast ‘tactically’, with voters second guessing each other to game the system. At the same time, the government is pushing ahead with its draconian scheme to force voters to show ID at the polling station. For Chloe Smith, government minister for the constitution, 28 allegations of fraud (out of 45m votes) is a 'significant' threat – but 350 people being denied a vote (in just five council areas) is a ‘success’. The government’s approach to democracy is characterised by doublespeak. We see the use of unchecked ‘Henry VIII’ powers extended to push through controversial plans without the need for MPs votes. We see devolved governments overruled. And we see the Committee system changed to guarantee Conservatives an undeserved majority in the key stages of parliamentary scrutiny. All the while, the PM continues to pack the second chamber with unelected party hacks and donors. In the face of this, the Labour response must be: where democracy is undermined, it should be restored. Where walls against democracy are built, they should be torn down. And where the rules of the game work against the vast majority, there must be an overhaul. Earlier this month Labour’s 2017 intake of MPs set out – in the Fabian pamphlet ‘New Brooms’ – the changes needed to sweep away the cobwebs in Parliament and make sure its processes work for members of all backgrounds. Now the party should look outwards – to determine the changes our democracy needs to fend off the threats it faces. Recent polling shows lack of faith in politics, politicians and government has for the first time become one of the top ten issues for Britain. There is an opportunity for the Labour party to reverse this trend. For these great economic efforts to last, the constitutional balance must also be shifted away from a small elite. To truly build on the legacy of the Chartists, it’s now time for a Charter for Democracy – embracing real reform of the hyper-centralised state. This is how we start to show we’re serious about giving ‘power to the many’. The public want change. Party supporters want change. Now the party can unite with a vision for revolutionising Britain’s broken political model – and soon.